From Crystal Mosque, we were heading to Sultan Mizan Zainal Abidin Stadium. 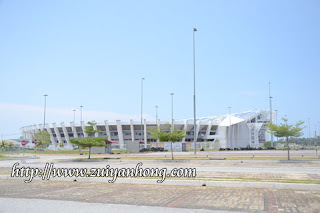 Located at Gong Badak, Sultan Mizan Zainal Abidin Stadium is a multi-purpose stadium in Kuala Trengganu. The stadium was completed in 2008 and it was used as the main venue for Sukma Games in the same year. It's so sad and embarrassing that Sultan Mizan Zainal Abidin Stadium was being used for a year before it hit the ground twice. The first topple occurred on 2 June 2009 and the following collapse on February 2013. 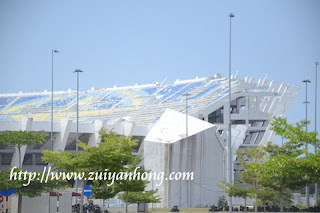 It was reportedly the cause of Sultan Mizan Zainal Abidin Stadium incident attributed to the inadequate design, materials and product quality not in accordance with specifications. 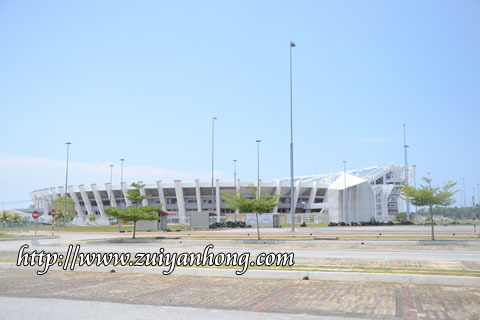 Recently, Sultan Mizan Zainal Abidin Stadium was reopened for football match during the day since February 2015. The FA Cup semifinal match between Trengganu and Lions XII was the first football match showcased at night in Sultan Mizan Zainal Abidin Stadium.